2010 Parker 1048 1,000-bushel double auger grain cart, 900/60XR32 tires, 18" unload auger, Avery Weigh-Tronix scale package, factory roll tarp, hydraulic unload auger discharge spout, transport lights. Sharp, clean, one-owner grain cart traded in on new track grain cart. Brent 880 corner auger grain cart, 850+ bushel capacity, green color, 1⅜" 1,000 PTO drive with shear pin and override clutch, 30.5LX32 diamond tread tires, roll tarp, scale package, hydraulic deflector on discharge spout. One owner; shedded. Excellent original condition, including original flighting. Serviced through shop and field ready. Parker 938 1,000 bushel double auger grain cart, 1¾" 20-spline 1,000 PTO, green color, roll tarp, 35.5X32 20-ply Firestone tires, safety tow chain, light kit (no scale). Serviced through shop. Sharp, clean grain cart. 2011 Brent 882 850+ bushel grain cart, 30.5LX32 R1 Firestone tires (no tarp or scale), 120" rigid axle, choice of 1⅜" or 1¾" PTO, excellent original flighting, one owner. Serviced through shop. 2010 Brent 882 850+ bushel corner auger grain cart, 1⅜" 21-spline PTO, 30.5X32 R3 Firestone tires, no tarp, no scale, safety tow chain, red color. Like new, one owner; always shedded. 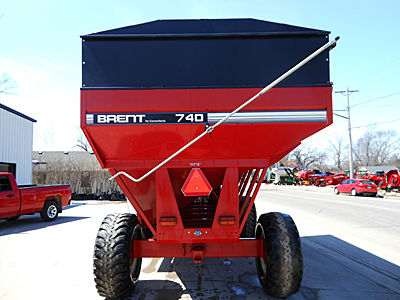 Brent GT740 grain wagon, 750-bushel capacity, 4 wheel brakes, 445X22.5 tires, roll tarp. Clean, sharp box. Note: This grain wagon was stolen off our lot in December 2013. Please contact us if you know anything about this theft or the location of this grain wagon. Thank you. 2005 REM 2500 heavy duty grain vac, 1,000 PTO, with hoses and tubes as shown in photos. Reconditioned through shop. Used Brent GT 544 550-bushel grain wagon, 425X22.5 tires, transport tow chain, road lights, two wheel brakes. Serviced through shop. Sharp. 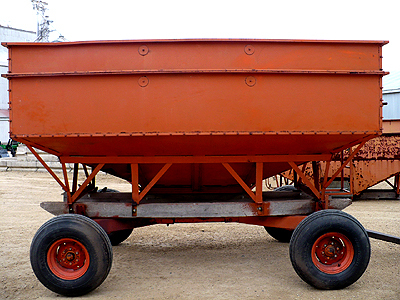 Used Demco 550 550-bushel grain wagon, rear wheel brakes, 425X22.5 truck tires. Serviced through shop. Very straight, clean unit. Used Brent 420 grain cart, 450+ bushel capacity, used 20.8X38 tires, 1⅜" 1,000 PTO, transport lights, front-fold auger, excellent flighting. Clean, straight grain cart; serviced through shop. Used Brent 410 grain cart, 1 3/8" 21-spline 1,000 PTO, 18.4X26 diamond tread tires. New auger in tank. Road lights. Two used Minnesota 400 gravity wagons, side and center dump pans, road light kits, heavy duty 14 ton running gear with 16.5L-16.1 tires. Both units are in very good shape. Two to choose from. H & S 450 grain wagon, 400+ bushel capacity with light package, side or bottom discharge, ladder on front of box, Knowles W1500 wagon (S.N. : 1188) with 165LX16.1 tires (three tires like new, one tire fair), two wheel rear brakes, extension tongue. One owner. Used J & M 350-20 gravity box (350+ bushel capacity), 12-ton Electric/Dakon wagon gear, 125LX15 tires on 15"X10" 8-bolt rims, extension tongue, green color. Minnesota 250 gravity box with 12" extension sides, model 10078 10-ton Minnesota wagon running gear, extension tongue, 11LX15 tires. Very clean box with excellent tires, original paint. Approximately 310 bushel capacity. 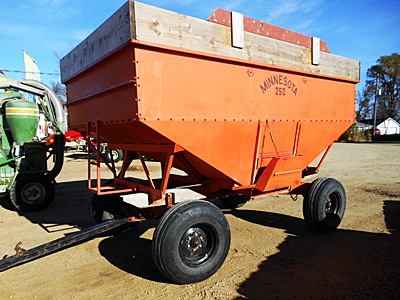 Used Minnesota 250 gravity box with 12" extension sides (approximately 300-bushel capacity), Minnesota 10078 10-ton wagon gear with extension tongue, 125LX15 10-ply tires with tubes on 15" X 10" rims. One owner, has been shedded, no fertilizer. Sharp. Minnesota 250 gravity box with 12" wood extension sides, 10-ton Minnesota wagon running gear, extension tongue, 125LX15 tires. Approximately 310 bushel capacity. Minnesota 250 gravity box with 12" extension sides, 10-ton gear with very good 125LX15 tires.